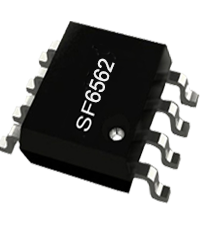 SF6562 is a transition mode (TM) power factor correction (PFC) controller for AC-DC switching mode power supply and lighting applications. SF6562 will clear external EA Feedback Network before IC power on. The IC also has Soft Start control to soften the stress on the MOFET during power on period. In SF6562, a highly linear analog multiplier with THD optimize is integrated to achieve low THD and high power factor. The zero current detector (ZCD) ensures TM operation. A restart timer is for stand alone applications. In SF6562, the proprietary "frequency adjusting" can help to improve THD performance, which ensures audio noise free operation. A VCC Over Voltage Protection (VCC OVP) is integrated to improve system reliability. The IC also has proprietary Soft Start Control to soften the stress on the MOSFET during power on period. In SF6562, the threshold for Output Over Voltage protection (OVP) and Error Amplifier (EA) are trimmed to tight range and internally temperature compensated. SF6562 integrates functions and protections of Under Voltage Lockout (UVLO), VCC Over Voltage Protection (OVP), Soft start Control, cycle-by-cycle Current Limiting (OCP), GD Clamping, VCC Clamping, Leading Edge Blanking (LEB). In SF6562, VCC OVP is auto-recovery mode protection.